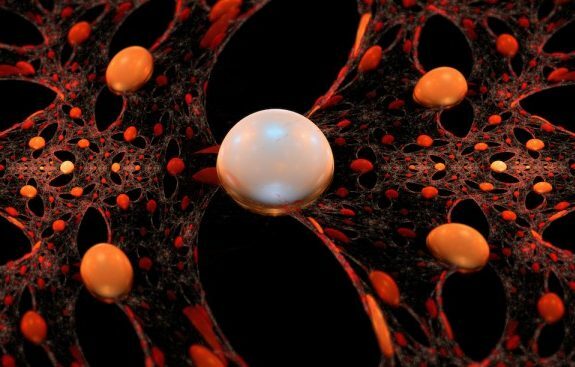 Zócalo on KCRW » Blog Archive » Could Nanotechnology Spark Another ‘Silent Spring’? 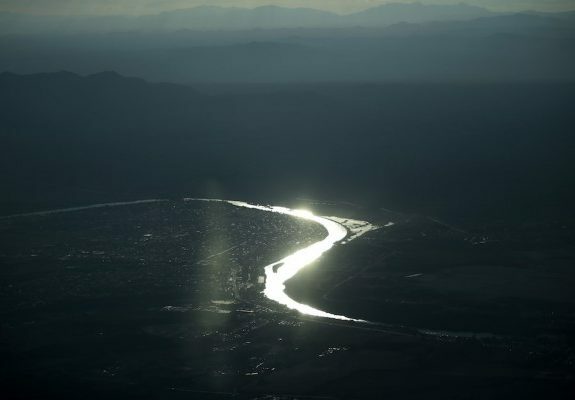 Could Nanotechnology Spark Another ‘Silent Spring’? Nothing can compare to the first night in a rainforest. In Honduras, in 2007, I hung my hammock beneath a lavish tree canopy, closed my eyes, and let insect chirps, rustling leaves, and the flow of a nearby river lull me to sleep. I was 19, part of a humanitarian group backpacking through the region. We were there to sample bat blood and swab geckos’ cheeks, among other tasks, so that we could find ways to bolster the jungle’s biodiversity and attract more ecotourism to the region. The magic of being in situ with nature stuck with me. I had never felt such a communion with it, never recognized in such a deep way that there was nothing between it and me. I felt I had a duty to protect it. Today, I’m a postdoctoral research scholar at UCLA, where I do research on nanotechnology—the science of manipulating matter at a molecular level. Commercially, synthesized nanoparticles—which are roughly the same size as viruses, about a billionth of a meter in length—are used to add features to everyday products, from sunscreen to self-cleaning windows to clothing. 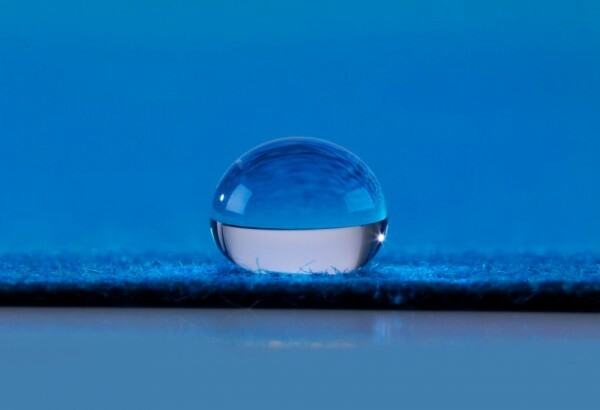 This may sound far removed from bugs, rivers, and trees, but there’s actually an intimate connection: Inevitably, through washing and weathering, nanomaterials will leak out into the environment. We don’t know for certain yet what, if any, lasting effects nanotechnology has on us and the world around us. Some nanomaterials may be harmful, others harmless, so we’re now trying to figure out which are which—and how to prevent any possible future detrimental effects. We need to figure this out quickly and efficiently. Nanomaterials are becoming ever more pervasive; globally, the nanotechnology industry is predicted to grow from around $30 billion now to nearly $78 billion by 2020. And that means more nanoparticles everywhere. When nanotechnology alters the basic properties of a material, that material’s behaviour changes. For example, a lot of “anti-odor” sports gear currently on the market uses silver nanoparticles, which release silver ions over time that kill bacteria. In pharmaceuticals, nanotechnology has been used for targeted drug delivery, which increases the chance of medication getting to where it needs to go in the body. 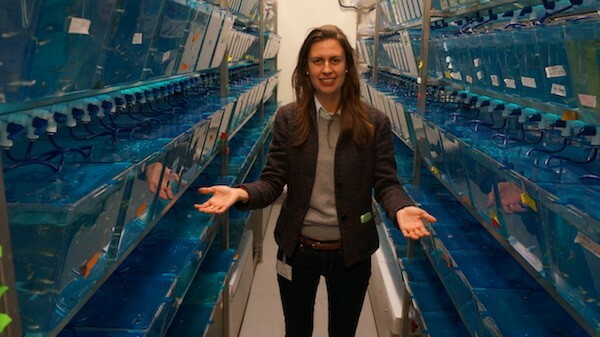 Olivia Osborne stands in the UCLA basement that houses the thousands of zebrafish she studies. My job, as part of a multidisciplinary team at University of California’s Center for Environmental Implications of Nanotechnology, is to understand how nanomaterials make their way from the things they were designed for into oceans and rivers, and what they do to fish in those waters. Specifically, I work with the zebrafish—Danio rerio, the small, torpedo-shaped stripy creature you probably know well if you’ve ever owned a fish tank. We house thousands of the creatures in rows of tanks in a temperature- and light-controlled basement, and study them in a lab. My research involves observing how different concentrations of these nanoparticles affect the fish as they go through different life stages. Zebrafish are perfect for big-scale scientific observation. They send me into fits of Steve Zissou-like enthusiasm. First, the adults lay thousands of embryos daily, which allow us to perform large toxicity screens. These embryos are wrapped in a transparent membrane, so it’s easy to observe any abnormalities that develop. And the embryos also grow to larvae in just a few days, so I can collect large amounts of data quickly. We are only just beginning to make full use them of in the adult stage. So far, my research has shown that nanoparticle size matters. 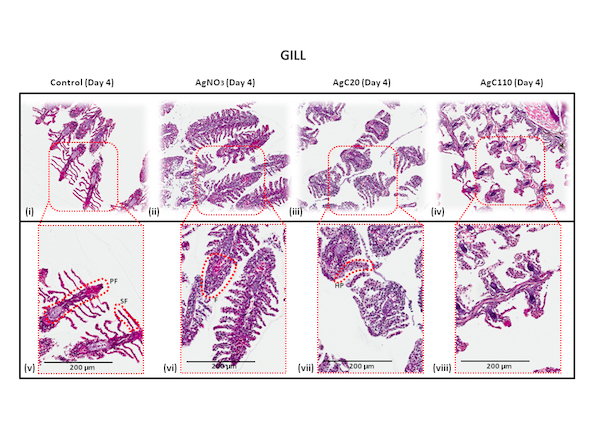 In a study published last September on the effects of silver nanoparticles, in particular, I found that the smaller the particles, the more damage they caused to the fish’s gills and gut. 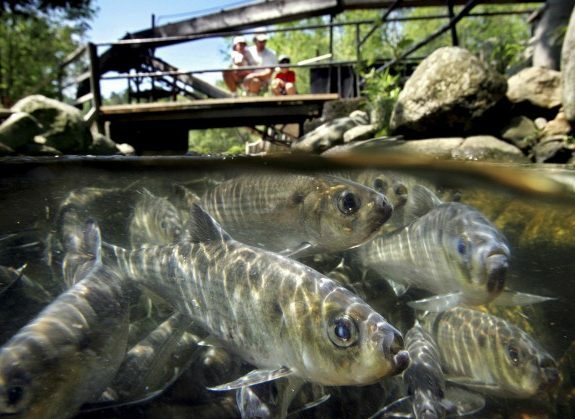 And small particles tend to linger, or “bioaccumulate,” in the fish’s system, even when the fish are transferred to cleaner waters. Over time, this bioaccumulation can build up through food chains. Magnified images of zebrafish gills, after the fish have been exposed different sizes of silver nanoparticles and silver nitrate. Compared to the normal gills in images i and v, the others show significant damage from swelling and fusion. The results from our zebrafish are beginning to give us a more detailed sense of which nanomaterials may be harmful in the environment and why. Since we’re learning how they cause damage to aquatic life, we’re now able to make recommendations to commercial producers about what their nanomaterials should and shouldn’t look like. With nanomaterials, which have many potential benefits, it’s important to find and set rigorous safety standards to avoid the sorts of environmental catastrophes that have happened in the past with, say, the widespread use of the pesticide DDT. Defining what is “safe” for nanoparticles sounds easier than it is. If you change the properties of nanoparticles to make them safer, you also might make them less effective. So companies aren’t always eager to accept certain guidelines. And while I hope my research will serve as the basis for future legislation, so far the government has been reluctant to set any standards for nanoparticles and for all the different industries involved—largely because the applications of nanotechnology are so broad that any blanket policies would be useless. No national regulations exist, and only a few states—including California—have made moves to put rules in place. 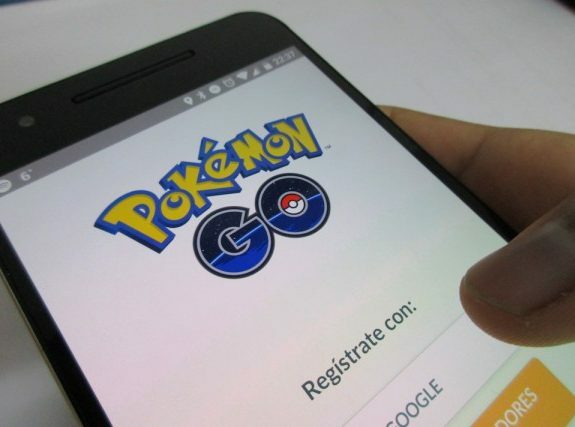 However, regulatory bodies such as the FDA and EPA increasingly are looking into the issue, which is encouraging. On one level, it’s deeply satisfying to know that my work is making a difference; despite slow national progress on the issue, I’m confident that the protocols we, as scientists, come up with are shaping industry norms, and that we’ll all be a little bit safer because of it. (Plus, it’s nice knowing I’m not going to be out of a job anytime soon.) But still, I ponder, I over-think. There are more than 2,000 nanotech products on the market today. Their accelerating production often feels impossible to keep up with. How many damaging particles will spread through the environment—and us—before we can detect them? In addition to science, I have another passion that reflects my interest in environmental stewardship: art. Working with water all day in the middle of a drought-stricken city has made me want reach an audience of non-scientists. In 2014 and 2015, I painted a series of scenes of California in the rain called Cry me a river California. I created the scenes with watercolors on canvas, then encapsulated each in glass resin. The idea was to “trap and protect” the water-tinged art to suggest the need for sustainability; look, water can even be preserved in art. 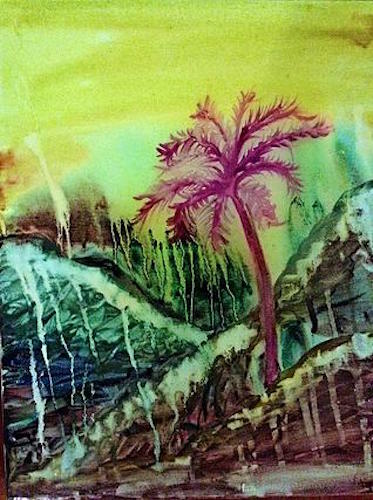 One of Osborne’s Cry me a river California paintings, a series of watercolors encapsulated in glass resin. You might think that there is a firm line between life in the lab and life in the studio, but that’s not what I’ve found. Both science and art begin with an idea, follow with a process of investigation, and result in a completed work. For me, art sparks my imagination when I’m mapping out experiments and presenting results. And science inspires me to explore new techniques in art. Both give me essential tools for thinking critically and creatively in caring for nature. Recently, I ran a race along the L.A. River—which, as any Angeleno knows, is now more concrete than water. The first half of the race faced downtown, which gave me the disheartening feeling of rocketing toward a dystopia. But when the race flipped direction for the second half, my spirits were lifted by a mall of trees leading to a backdrop of flourishing mountains. (I’m sure the endorphins helped, too.) Even around one of America’s most sprawling metropolises, I was reminded, there’s natural beauty everywhere. I finished the race, then got back to work. Olivia Osborne is a postdoctoral researcher at the University of California’s Center for Environmental Implications of Nanotechnology at UCLA. *Lead photo courtesy of P2i labs/Wikipedia. Interior images courtesy of Olivia Osborne. 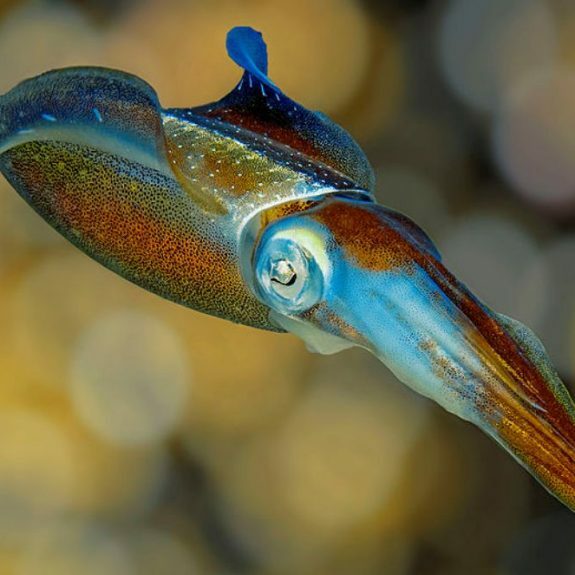 Will Squid Soon Rule the Oceans?